Corded lawnmowers are a great choice if you have a small lawn to deal with. Corded mowers are quiet and, more prominently, affordable. In order to help you narrow down your options, here are ten of the best corded mowers on the market. The AdvancedRotak is a high-end corded mower that’s ideal for those with mid-sized gardens. 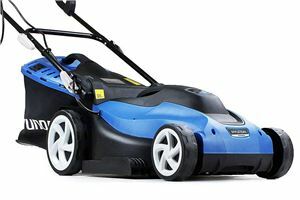 It has a cutting width of 41cm, a large 50-litre grassbox and a powerful 1700W motor. 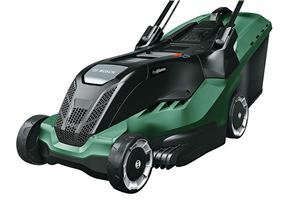 It also has a maximum cutting height of 80mm, helping it tackle more challenging lawns. It only comes with a 10m mains cable, though, so you’ll probably need to buy an extension lead – but, on the flip side, you do get a three-year warranty when you register online. 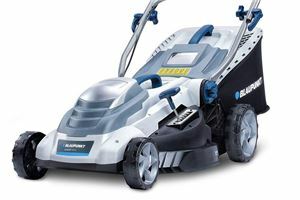 If you’re looking for a larger corded mower but don’t want to spend too much, this straightforward Blaupunkt offering is well worth considering. 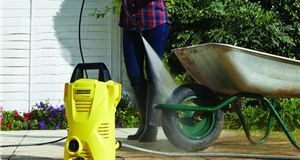 Like other alternatives here, it has a 42cm cutting width, a stout 1800W motor, a 50-litre grass collector bag and a three-year warranty. 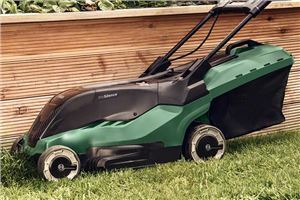 Its maximum cutting height is 65mm, though, which makes it marginally less capable of dealing with excessively long grass than its rivals. It also only has a short 10m cable. 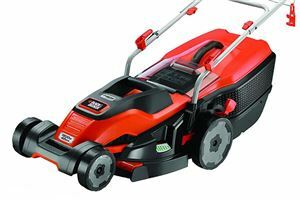 This Black & Decker can help cut down mowing times thanks to its wide 42cm blade. 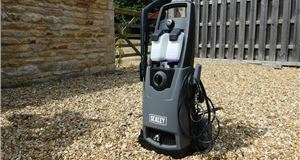 It also packs an 1800W motor, meaning damp or thick grass shouldn’t bog it down, while a neat cable management system helps keep the trailing wire out of the way. It is slightly noisier than the Bosch alternative, though, and the maximum cutting height is a lower 70mm. You also only get a two-year warranty, compared to the three offered elsewhere. Although this mower is one of the more affordable corded options around, it’s no cut-back budget offering. 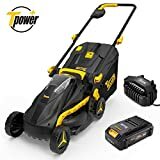 It has a 38cm cut, so cutting your lawn shouldn’t take ages, and it has a punchy 1600W motor that won’t struggle when it comes to cutting thicker grass. It also has a large 45-litre grass bag, so you won’t need to empty it all the time, and it comes with a 12-metre cable. More importantly, it also has a three-year warranty. 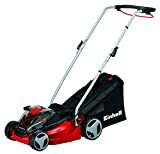 This mid-range Einhell mower is a good choice for those seeking a no-frills corded mower. 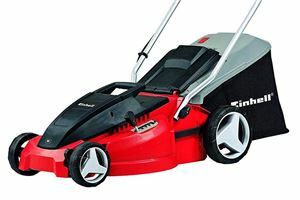 It has a decent 36cm cutting width, a 1500W electric motor, a 38-litre grass bag and a maximum cutting height of 65mm. It also weighs in at a sensible 10kg, making it easy to push and manoeuvre. It admittedly only has a one-year warranty, and it is noisier than rival offerings, but it’s hard to otherwise fault for the money. Need a corded mower that can easily tackle a larger lawn? You might want to consider this flagship model from Bosch’s AdvancedRotak line. 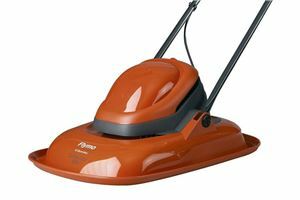 It’s not cheap but it features a substantial 45cm cutting width, a 1700W motor, a 50-litre grass bag and a maximum cutting height of 80mm. It’s also quieter than many rivals and comes with a three-year warranty. Just remember to budget for an extension cable, as the stock lead is only 10m long. This Flymo offering, unlike others here, has an integral rear roller – which means it will leave a smart striped cut. The roller also makes it far easier to handle when you’re mowing over curbs or border edges, as the mower won’t be as prone to tipping. 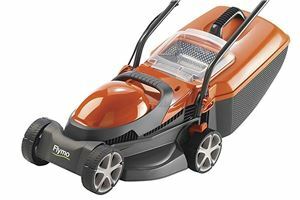 This relatively lightweight Flymo is designed for smaller gardens, though, as it only has a 32cm cutting width and a small 29-litre grassbox. A one-year warranty is standard. 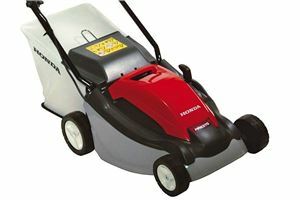 If you fancy a brand-name mower with a good warranty, this Honda’s worth investigating. 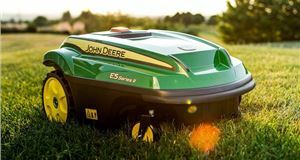 It has a 37cm cutting width and a 35-litre grass bag, meaning it can tackle an area about the size of half a tennis court with ease, and five cutting heights. It also comes with a long 15m cable, unlike rival offerings. Assembly can be a little fiddly but you do get a two-year warranty, which should allay any fears about reliability. 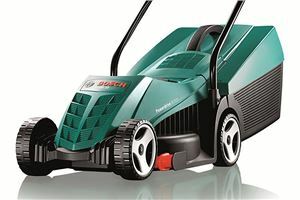 You don’t need to spend a fortune to get a brand-name mower, as this Bosch offering proves. This version of the Rotak is aimed at small gardens and packs a 32cm cut, a 1200W motor and a 31-litre grassbox. 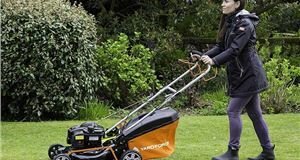 It’s very easy to use, like the other mowers here, but it tips the scales at a mere 6.8kg – meaning it’s easy to manoeuvre. Register online and the two-year warranty gets extended to three years, too. Some of the larger mains-powered mowers clock in at over 15kg, which can make them difficult to handle. This Flymo, however, clocks in at just 6.5kg – and floats on a cushion of air, further making it a doddle to push and manoeuvre. It has a relatively narrow 33cm cutting width, so it’s best reserved for smaller gardens – and it also doesn’t collect the grass. Flymo does offer other versions that can collect grass cuttings, though.